SDOT last week released its updated workplan (PDF) for the Move Seattle levy, the 9-year, $930m program that includes everything from streets and sidewalks to buses and bikes. While the original levy included 7 “RapidRide+” corridors, it became apparent in April that SDOT didn’t have the money to do all 7 and would be scaling back. Mayor Durkan ordered a review and a new workplan. We got a hint of the new scope in September, when Metro announced that only 4 new RapidRide lines would launch by the time the levy expires in 2024. Now we have a better sense of how SDOT is prioritizing its portion of the work. All of the projects are getting bumped 1-3 years. Budgets listed below are totals for each project and include a mixture of levy funds and other federal, state, and local sources (some as-yet-unidentified). As you can see, the level of investment varies greatly from line to line. To recap, that’s three new RapidRide lines (G, H, Roosevelt), three lines (40, 44, 48) that will see “bus lanes, channelization, and signal optimization for buses, and signal priority for transit,” and one line, the 7, that will fall somewhere in between: SDOT will do some stuff then Metro will come in later and finish the job. Read the SDOT blog post to learn more about the other aspects (bikes, sidewalks, streets) of the updated plan. So, if Roosevelt RapidRide is going to end at 65th, what happens to the 67? Do you just terminate it at 65th and make everybody switch buses one mile before their destination? Do you run the 67 and RapidRide in parallel? Do you shift the 67 over to 15th between the 65th and Pacific? There will be a major restructure once Link gets to Northgate. At that point I would change the 67 so that it ran up through Pinehurst (replacing the 73/373). I wrote a Page 2 sketch of the idea: https://seattletransitblog.com/2017/03/12/north-seattle-bus-routes-after-northgate-link/. I’ve since changed my mind on a few of those routes, or at least come up with other options I think are worth considering. But in general I’m not thrilled with the 67, as I think a button hook like that is a bad idea. I also think that we will be sending plenty of buses to Northgate — so many that we probably want to lighten the load there. Buses coming from Shoreline, Mountlake Terrace and Snohomish County will terminate at Northgate. There will also be buses like the 75 and a truncated 41 (connecting Lake City with Northgate). When Northgate station opens, so does Roosevelt station, and if you are on Roosevelt, it is faster to just head south to 65th, rather than do all the twists and turns to serve Northgate. I think sending the 67 straight north-south makes for a better overall network. That is exactly what I was thinking. I’m going to write a little Page 2 post about that idea. I have a map, but it might be a bit confusing, because it has several options. I do think it is worth checking out though. Just ignore the various options (which need a little explanation) and check out the new 26 on this map: https://drive.google.com/open?id=1QxKLOnWqi4rSq6We44tR3l5hnOYxzcQB&usp=sharing. It is pretty much a straight shot, which provides more coverage while being faster. A big key is the new pedestrian bridge, which means that folks don’t have to always take a bus from the community college to the Northgate Station. The 345/346 would still do that loop (there is really no obvious alternative) while the 26 would go on 5th, and so too might the 40 (from the north). Once the Lynnwood extension opens, Northgate will probably fade in importance as as a “transit center”. It will be a popular station with good density, but the realities of its siting — a freeway on the west and a restricted street network on the east — will gradually result in buses being routed to other stations to the south or north. Malls in general are also not the hubs that they used to be, and this one is slated for a shift away from retail already. In contrast, I predict that the Roosevelt station will gradually become more of a more important transfer point. Several streets can feed the station diagonally (especially Lake City Way) yet it avoids the localized congestion in the U District. Of course, Metro will ultimately develop and operate the route structures in north Seattle. I’m just predicting that the added time to get to Northgate will be such a big factor that incremental restructures will result in fewer Northgate routes and more Roosevelt routes anyway. f the potential of it already with Thornton Place, but it remains to be seen as to how Northgate will change in the coming years as Link comes online there. I wish. The mall owners are planning a mixed-use redevelopment but I think it’s only 3-4 stories. The mall lot is the only lot zoned for highrises (200 feet? ), so the surrounding lots will be more of the same. Northgate, the U-District, and downtown are the only designated urban centers in Seattle, so we’re missing a huge opportunity to make it like Metrotown so that a lot of people can live there. If we’re going to contain growth in 25% of Seattle’s residential land, then those villages need to GROW! Northgate is a decent destination, with the college connected via a bridge, and a bunch of medical offices along with retail in the area. But it isn’t a major destination (the way that the UW is). It is basically a little bit above Roosevelt as well as Lake City (and will likely remain so). Once Lynnwood Link is built, there will be fewer buses sent to Lynnwood, as Al said. In many cases, it is just more convenient to send a bus to Roosevelt (and possibly on to the UW). In other cases, it is easier to just end up north. But in that regard, it will mean an increase in service to Northgate when it is the terminus of Link, followed by a return to something similar to today. You are still going to want to have buses connecting Lake City with Northgate. or Pinehurst with Northgate. Likewise, until the NE 130th station is built, Northgate makes sense for the terminus of the 40. After that is built, you might send the 40 to Lake City (via 130th). I could also see the 40 going to Northgate (like today) but the D extended to Lake City. It might even make sense to do something like this: https://drive.google.com/open?id=1ped7HgluGUQJWmP7gBV8OzIzIic&usp=sharing. That means that you have a very frequent, fast, connection between various parts of Ballard/Greenwood and Lake City/Northgate. You would still have service along Northgate Way/105th (between Greenwood Avenue and 5th) but it wouldn’t be as frequent (like the rest of the route, it would be more coverage oriented). That means the major connections between the big neighborhoods is fast and frequent, while other parts of town get decent service (every 15 minutes). That’s all because of zoning decisions. It will never be like the largest university in the state (of which there is only one), but it could have become like downtown Bellevue if Seattle had allowed and encouraged the growth there. Lynnwood would even be scared that it would attract all its future businesses. Sure, zoning played a part, but you could say that about plenty of other places. Queen Anne and Capitol Hill would have skyscrapers if they let them. If left to their own devices, I’m still not sure if Northgate would be much bigger than today. It really is nothing special (unlike Queen Anne or Capitol Hill). Downtown Bellevue is a different thing. Businesses simply moved to the suburbs, often in sprawling business parks (not that different than some of the medical buildings close to Northgate). Microsoft was one of the businesses. That, in turn, lead to a lot more people and businesses moving to the East Side. As businesses started moving back towards urban centers, Bellevue was well poised to take advantage of being as close to an urban center as you can find on the East Side. Northgate has added quite a bit of residential housing (and the construction is ongoing). If they allowed taller buildings, then maybe they would build them, maybe they wouldn’t. Any higher and you have to build with steel, and for an area like Northgate, it is harder to justify. Folks would rather live on Queen Anne or Ballard, rather than Northgate (even though Northgate is more convenient). My guess is if they just let the city grow naturally then the biggest change is that the UW would be much bigger (the Safeco building would be just typical for the area). Being next to the biggest university in the state, and less than four miles from downtown counts for a lot. Of course everything in between (Montlake, north Capitol Hill, Eastlake) would look dramatically different as well. The issue is jobs in Northgate. If you had more vertical office buildings and retail buildings in Northgate then the residents would follow to be closer to them. Some people will always prefer to live in Queen Anne or Bellevue, but others would be happy to live near the jobs and shopping in Northgate. One tech company might not choose it, but when you have dozens of tech companies all looking for a location, some of them might choose it, and that would make it more attractive for others. I’m sure the 67 will continue running to at least U-District Station because it’s the second-largest urban center in Seattle with hundreds of people riding to it daily. I can see the 67/75 through-route continuing because that conveniently gives a one-seat ride to south campus and U-Village and Children’s while simultaneously serving the 65’s needs, and Metro seems very pleased with this corridor. The Pinehurst extension sounds like a great idea. It may need a nudge from us to overcome inertia. But it solves the problem of the 73 and gives Pinehurst more frequency to Roosevelt and the U-District. Right now everything converges in Northgate because it’s the only transit center north of 65th, it has the 41 which is the only frequent all-day express to downtown, and the plethora of shopping destinations. But when Northgate Link opens I think the priority will shift from going to Northgate to going to “a Link station”. Link gives you access to many parts of the city and suburbs, much more conveniently than the 41, and if you do want to go to Northgate it’s just a 3-minute trip from Roosevelt Station. Exactly. Once Link comes along, Northgate Station becomes just another Link station, as opposed to being the main way to get from the north end to downtown. Disappointing, but expected. The previous administration was scandalous in the way they handled the MoveSeattle levy, and now this administration has to deal with the aftermath. Ultimately the city needs more money for these projects, but now they need to regain the public trust. I would say that they are dealing with things about as well as they can. It wasn’t likely that the Roosevelt RapidRide would be extended to Northgate, nor was it essential. Density weakens between 65th and Northgate, nor is there an obvious preferred corridor. I think it is just as well to have regular routes along the various corridors. Having the G use diesel buses stinks (both literally and figuratively). But it at least gets our foot in the door. All the right-of-way improvements will be made, and they can always add wire later. It remains to be seen what will happen with the 7, 40 and 44. Little improvements can make a big difference, but it is easy to justify a big investment in each corridor. In all cases some center running buses would be nice — I’m not sure if that will happen, though, until they pass another levy. The 48 looks like it has a chance to be built pretty much as hoped. I always felt like the new bus lanes were simply delayed, not eliminated. It didn’t make that much sense to add them before the 520 work is done. From what I remember, the Montlake area was the only place where they had planned a lot of new bus lanes, since much of 23rd is just too narrow. As with Madison, you can always add the wire later. Not ideal, but probably the best we can hope for now. The city has to just keep plugging away at these projects, while pointing out that they would do more if they had more money. Hopefully in a few years, when the new administration has built what they promised, they can ask voters for more money. While Delridge has certainly waited long enough for more frequent service to un-stuff the buses a little, I still hope the H Line evolves into Delridge Station to SeaTac Airport Station after West Seattle Link opens. Let it fly right by Burien Transit Center and get people to the largest blue-collar living-wage employment center in south King County. Not if Ballard can help it. I think STs plans are to spend all monies from ST3 to STInfinitum on Ballard. I mean why spend money on a less subsidized system which better leverages existing track and stations when there are squeakier wheels to be heard and inefficiencies to be found. Burien and RapidRide are an eternal marriage that will never be broken, get use to it! It’s a longer walk from Ballard Avenue to a Sounder station than to 15th, and Sounder would be much less frequent. An urban village needs 10-minute transit access until late evening, not a few times a day or even hourly or half-hourly. Otherwise you’re just replicating a suburban neighborhood and encouraging people to keep driving. I still hope the H Line evolves into Delridge Station to SeaTac Airport Station after West Seattle Link opens. That would make a lot of sense, since the rest of the 560 would be replaced by 405 BRT. Someone in Burien would continue to have a one seat ride to SeaTac (or downtown Bellevue via 405 BRT). Someone along the Delridge corridor would have a one seat ride to SeaTac as well (and not just folks in Westwood Village). My only concern would be if that tail (the area serving SeaTac) would have enough ridership. The 560 has nowhere near the ridership of the 120. SeaTac serves around 200 people day from Burien/Westwood Village. That number would go up with more frequency, and no transfer for folks along Delridge, but I doubt it would come close to the rest of the 120 (which carries somewhere around 9,000 people a day). Of course you could always have a truncation half the time (as you do with the 3 serving Madrona). That would work out nicely, in my opinion. Good point. It is hard to determine how many people are trying to get from Burien to SeaTac, since there are two different ways there. But the F is the lowest performing bus route (5,500 people a day) and I doubt most of them are going to TIBS (it is a Metro route, so no stop data). But we do know that only 500 people a day head from TIBS towards SeaTac. So even if all those people got off the F, it just isn’t a large number. As I said before, the number would obviously go up if there was a direct, more frequent connection. It would be reasonable extension of the 120. The 120 only runs every 15 minutes now, so it wouldn’t cost that much. During rush hour it runs a lot more often (every 7 minutes) so you could easily just send half the buses there at that time (to save some money). When I’ve ridden the 560, most of the ridership is between Renton and Bellevue. Like most good airport connector, the airport connection is a secondary generator of ridership. My understanding is Metro is going to use the H to serve SoDo (the neighborhood, not just the station), while the C would be rerouted to serve Admiral and Alki. So if the H was Delridge to SeaTac, there would need to be another route to serve Delridge to SoDo (a Link shadow, sorta). Looking at the long range map (http://www.kcmetrovision.org/wp-content/themes/kcmlrtp/LongRangePlan/#) I don’t see the SoDo route you are talking about (at least not for RapidRide). If you select the 2040 button, and uncheck all the layers, you can only see two RapidRide routes in West Seattle. The first is the 120 (or H) basically unchanged (and includes going downtown). The C is basically gone, replaced by a new route that is somewhat of a combination of the 50 (to the north) and the 128 (in the south). But those are just the RapidRide routes. There are plenty of other bus routes that connect to SoDo. Right, I was just talking about #1041, which serves a nice bit of 1st Ave before heading into downtown. The routing does a nice way of extending the “transit-shed” for SoDo station, while also providing a 1-seat ride for Delridge to SoDo, where the transfer penalty to Link is much worse than traveling a few Link stops further into the Seattle CBD. The 2040 plan does not have any Frequent service on that road – just the #1088 on 4th, which is great but serves different trip pairs. Yes, there are some local routes, but that’s low frequency. I think there is value in RR level of service (span & frequency) on 1st Ave, so I was asking the thread for an good alternative, if the H is to be terminated at Delridge. Also, back to the SeaTac discussion, I’ll point out that unless there are bus lanes on the airport expressway (unlikely), sending a RapidRide bus directly to the airport is a great way to burn a ton of platform hours, given it can take 30 minutes simply to enter and exit the airport during peak congestion. I would much rather simply extend the H to TIBS and have minor overlap with 405 BRT than send the H to the airport directly. The 2040 plan has the H meeting the F in Burien; having the H meet the F in TIBS instead is kinda one half dozen or the other, but if West Seattle values a 2-seat ride to the airport vs 3-seat, that could be compelling. Add in transfers to the A and a few other routes, and that turns TIBS into a major node, which seems like a good thing. Could make the same argument for the C to extend to TIBS, though having both C and H go beyond Burien to TIBS seems like overkill, probably only need to send one. I’d support the idea of extending RapidRide H to TIBS and dropping the F for that segment. TIBS isn’t the best place for through-routing on SR 518 either (the 405 BRT plan). As Link increasingly becomes the preferred mode for longer regional trips and has reliable 6 minute peak and 10 minute off-peak frequencies, it makes more sense to begin or end a RapidRide route at a station rather than be almost at a station. Having RapidRide stops every 1/3 of a mile makes Link even more attractive. My only issue with extending the H to TIBS (besides whether the details of the routing screw me over personally) is there’s not a whole lot of spare layover space there. Granted I don’t know Metro’s policies about that except via observation there and Burien TC, but I’d be surprised if there was more than 4 spare artic layover spaces at peak. To be clear, 405 BRT will go from Burien to Renton (and TIB in between? ), but not SeaTac or Westwood Village. So other routes would have to do those. ST’s preliminary plan extends the 574 to Westwood Village to replace it. Extending the C to White Center or Burien has some merit, and Metro’s 2040 plan has a 128-like RapidRide that does that. The F would run from Renton Landing to TIB? Wouldn’t that be bad for Burien residents shopping/working in Southcenter or going to Renton? Many of the apartments in Burien are along Ambaum, so riders already have to transfer from the 120 (Future RapidRide H) to RapidRide F at BTC. This would simply be moving the transfer point from Burien TC to TIBS. Because 405 BRT commits ST to running high-frequency buses along 518 and 405 from Burien TC, riders can transfer there and get to South Renton TC much faster than if they stayed on RapidRide F and endure the zig-zag, zig-zag route through SouthCenter and Tukwila Amtrak. 405 BRT is also going to have a stop at TIBS, so There will be two ways to get to TIBS, giving people traveling from Burien TC two frequent options. Of course, that the change would mean that some people along S 156th in Burien would have to transfer to get to SouthCenter that don’t today. Some of the local Burien routes may also need to be reconfigured to end at TIBS or SouthCenter. Still, many people in SE Seattle and in Renton can’t take a direct bus to SouthCenter now — even within 2 miles of the place (noting that Burien TC is 4 miles away). One other plus taking RapidRide H to TIBS is that it would give riders a one seat ride to both RapidRide A and Link. Ending RapidRide H at Burien TC means a double transfer to get to almost anywhere on RapidRide A or Link in South King County (including SeaTac). Delridge corridor residents would have a easier way to reach SeaTac. I really do wonder how they’re going to manage to get 405 BRT to have access to TIBS. There’s no on ramps to 518 Westbound at International Boulevard, and where the bridge is makes any freeway stations precarious on space (there’s an on ramp eastbound but I’m not sure if there’s an offramp. And having a frontage road-style stop would be very bad for there, it’s a huge slog to get over to 154th/Southcenter.). Good point, I’m always an opponent of double transfers within a short distance. I generally say two miles, to allow downtown-UDist-NorthSeattle but disallow 36+FHStreetcar+49. But in the suburbs a 4-mile gap between Burien and TIB may also be undesirable. And buses meeting at Link stations generally make sense. The biggest problems in Renton and Kent is that the trunk routes (150, 101, 106) terminate in the city center but most of the population lives two miles east of there. When Aleks made her South King County restucture she moved the trunk termini from the city centers to further into the residential concentrations, and the other end at Link stations (Rainier Beach). Perfect example of the “flexibility” (Public Domaine) I keep talking about. How much of the future we need can we create with the buses, stops, streets, and signals we already have? And can get? What’s toughest diesel bus available by the rules? Can’t anybody in US or Canada still make those? And fir with an electric motor? But meantime, since we already run trolleybuses on Madison, how many passengers can we carry with them, and how fast, right now? And incidentally, what exactly is the problem with our 60′ electrics? But meantime, can’t we really “stage” buses in “platoons” like was supposed to happen in the DSTT? Center platform? Look. We’re talking about plain bus stops moved to different lanes, aren’t we? Federal Way and Bellevue transit centers both use right hand doors . So any bus can be signaled across an intersection on the diagonal. If we need a human at every switch- worth it for time being. Some very narrow well-anchored concrete planter boxes full of thorny bushes should keep us and the cars and jay-running pedestrians from hitting each other. And how far inward would we have to move existing wire? One lane each way? I’m still not convinced that Route 48 is worthy of getting prioritized for RapidRide funding. It’s not in the top 25 percent of productive routes. The UW-Mt Baker trips that used to ride this route have shifted to Link and more will likely shift once the U-Dustrict station opens. New Link stations could make this route more attractive —but most of this route is residential so it really is going to be more of a feeder route in the future. Rather than cut back in other corridors, I’d rather see the money shifted to them to do them right. I would also rather see speed enhancements to the east-west routes in the area (Routes 2/3/4). I agree – wasn’t Metro caught off-guard when they split the 48, thinking that most of the riders were on the Mt Baker/UW side when really they’re on the UW/Sunset Hill side? Given that, it seems that the 45 deserves that treatment more than the 48. The last system report Metro released confirmed that, with the 45 having about 1100 more daily riders than the 48. I don’t know about that. The 45 is getting all the riders between 65th and the U-District. I assumed the routes would overlap to 65th, but instead the 48 terminates at 43th. Nonsense. The only reason the 48 doesn’t perform that great is because it is slow. The same is true for the 8 and the 44 (both corridors worth considering for light rail). Link expansion wouldn’t replace the 48 (since Link doesn’t follow that corridor) but enhance it. Say you live along 23rd. Even better, let’s say you live right next to one of the most popular crossing routes, the 3/4. So basically, you are right by Garfield High School. Now imagine you are headed to Northgate. Right now the only logical option is to slog your way on the 3/4 to downtown, and take the 41. But in a few years it will make way more sense to take the 48 and then transfer to Link. For Bellevue, the obvious choice is to ride the bus south, then take the train. To the airport it makes sense to do the same sort of thing. To get to the UW, it makes sense to take the 48. Sure, most of this route is residential, but that is true for just about every route in our system (as well as our light rail line). But it is relatively high density residential, but more importantly, runs on a major connecting corridor. It crosses several important bus routes, and will soon cross 4 Link stations. If it is extended to include the tail of the 7 (as planned) that would go up to 5 (as it loops around to serve Rainier Beach, ending there). That means any of the Link destinations (downtown, the airport, Northgate, UW, Bellevue, etc.) from most of that corridor make sense via the 48. Whatever shift to Link was going to happen has happened. If you live close to the Capitol Hill station, and used to take the 8 (or walk) to 23rd and then take the 48, you take Link. Likewise, the high frequency of the 49 is a solid option to get to the U-District. But for most of that route, the 48 remains the only viable option, and if it is faster, a better one. Clean up the mess around the Montlake Bridge/520, add off board payment and a little signal priority, and now it is the better choice for a lot more riders. If I’m trying to get from Rainier Valley to Swedish Cherry Hill (a relatively minor, but still significant location) then I could ride the 7 all the way downtown and ride the 3/4 back up. I could make it a three seat ride by including Link somewhere. Or I could take the 48, then the 3/4. There are just a lot of routes that are shorter, and thus have the potential to be faster if the 48 runs at a better clip. I’m not saying it is the most important corridor, or the one we should do next, but like the 120 (which isn’t the most important one either) it is worth doing. The RapidRide+ corridors were really well thought out. The only significant omission was Lake City, which makes sense to add when the 130th station is built (when the D or the 40 could end in Lake City). Unfortunately, most of them are in jeopardy because the previous administration was run by liars. When the decision to make Route 48 a RapidRide priority, the ridership was more than double because it was tied to the now-running Route 45. It was one of the top 25 most productive routes in their 2016 report! It’s reliability was horrible, too. If a rider was going to the U-District, it was the transit vehicle of choice and clearly a candidate for RapidRide status. Link changed that, and will change it even more in the future. The split to Route 45 also changed things. The latest report referenced above shows no reliability problem on Route 48. The latest report shows that the shortened route has 30 percent less productivity than the previously combined route did (49 peak/45 off-peak passengers per hour to 35 peak/25 off-peak passengers per hour). There ae a handful of new apartment buildings in the corridor, but they are pretty much at Madison, Union and Jackson. It’s curious that you mention Garfield and Cherry, because there is no residential density in those several blocks more than townhouses. It’s unclear if the Judkins Park opening will make things better or worse for Route 48. Jackson St is about 1/2 mile from the new 23rd Ave entrance so people may choose to just walk once the station opens. Finally, “going RapidRide” for what is usually less than a 1.5 mile ride here won’t add much travel time. The road was just rebuilt. The biggest problem is that buses much slowly slog on 23rd with regular traffic and that won’t change. There just isn’t much benefit that engineering can provide given the relatively short rider distance and inability to change the roadway geometry. The decision to target it for RapidRide in past years was certainly reasonable (albeit a bit naive on the effects of Link on route productivity). The latest performance report however casts serious doubts on the value of a RapidRide investment on this corridor when compared to others. The 45 is also picking up riders because it shifted to University Way, and is thus an attractive choice for those who can take any of the 45/71/73. It’s also more direct between the center of the U-District and 65th & Roosevent than the 48 was, so that has also attracted riders and probably encouraged them to make more trips that way. I doubt that Greenlake, Greenwood, and Loyal Heights ridership has increased much. Maybe if it’s more reliable; the old 48 was often late. Research difficult because even though I really have read my last free Seattle Times article, I can’t find the coin slot on my computer. But am I right that Mayor Durkan has changed her mind about the Head Tax and a possible bike lane on 64th? Not automatic sign of dishonesty. Just reminder that a lot of ideas and realities will quickly change over next years- opening areas of debate that hadn’t been possible the day before. A piece of spring steel is still reliable when pulled temporarily out of shape. So main thought about dealing with Seattle City Government right now is a constant series of technically workable alternatives for practical, as opposed to theoretical, transit building problems. And valuable habit to develop: design everything so that a variety of changes are relatively easy. Remind me, is that “Future Proofing” or its opposite? To borrow from Andrew Lloyd Webber, a rousing chorus of “Link Changes Everything” seems timely. A new rousing chorus after 2021, 2024, 2030 and 2035 will probably be appropriate. That’s not to say that Metro will be less important but that its role will be increasingly more of a feeder system for trips longer than 2-3 miles. I’m not currently a frequent rider of the 44, but it’s always felt to me like the stretch of NE 45th St roughly between 15th Ave NE and I-5 is the most painful part of the route. Does Metro have any public data showing where the slowdowns on the 44 stem from? Is there any hope of speeding up the 44 along the U-District portion of its route? Getting rid of the pullouts in top of I5 would be a place to start, so the bus doesn’t have to merge back into traffic. I’d actually extend the “worst part” designation west to Latona. Like asdf2 said, the pull-outs are awful, and Latona’s stop can’t benefit from the median curb that’s at Thackeray. Unfortunately, the stop can’t be moved because of the gas station parking lot. 1. At peak times, the 44 has to share stops with Community Transit. CT seems to have a policy where the driver isn’t allowed to pull away from the curb until the last rider sits down. Might’ve been thirty years since I looked, but seem to remember a “Bus Only” signal near side of the off – ramp from I-5 onto 45th. Haven’t noticed any more signal pre-empt between 15th and Stone Way either direction since. Same with reserved lanes. Think that if troops and ammunition from the West Seattle-Ballard war could be tactically shifted to this front at least ’til Wallingford street parking is fleeing toward Texas, could be easier to get the subway too. When’s last time anybody checked the Wallingford business community to see if any of them yet think that new development + faster buses will bring them more customers? But U-District blocks- no chance that LINK station might let faster buses be sneaked into opening ceremony? The piece is silent on the CCC streetcar, the fiscal elephant in the room. suppose the CCC was cancelled and some of its capital funds shifted to Route 48 and 7 overhead; the latter connects the Rainier Avenue South corridor and its multifamily housing with the South Henderson Street Link station. Is Madison RR well-designed? why does it miss Link stations? do we not want to provide better transfer walks (e.g., UW Link, Mt. Baker, SeaTac; or, what would Translink do)? if the mode is changed, should the alignment change? re Route 44, SDOT has begun a study. Is Roosevelt well designed? Should Route 70 be the RR line so that it serves NE 45th Street Link and the campus? You should ask, “Why does the DSTT have no Madison station?” Or “Why isn’t University Street Station a couple blocks further south so that it would serve the main east-west street in lower downtown and First Hill?” Madison RR can’t help that, just like it can’t help that Capitol Hill Station is between Denny Way and John Street. If it detoured to either of those stations it would serve the Madison corridor worse. The plan for the second tunnel for the Ballard-Tacoma line has a Madison station, so that’s a partial answer. Route 70 is the RR line. It will go to U-District Station. Going into campus would contradict the need for a north-south corridor, especially because Roosevelt Way will grow to be the center of the U-District’s density. 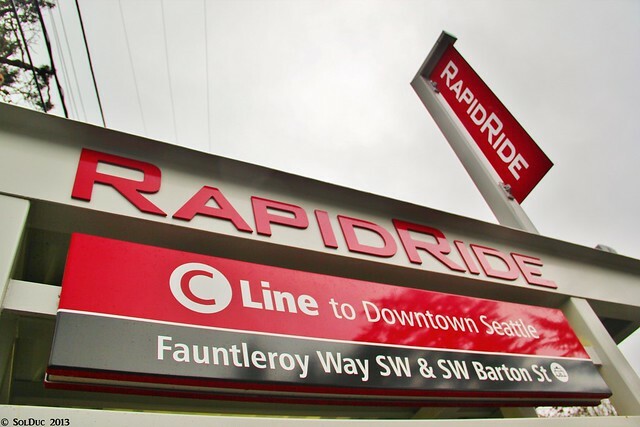 The name “Roosevelt” RapidRide is increasingly becoming archaic; it’s really an Eastake-Fairview RapidRide. But there are lots of trips all up and down Roosevelt, Fairview, and Eastlake. I used to live at 55th and University Way and I saw that. The greater U-District community and all that north-south travel really end at 65th, which is right where this line will terminate. Yeah, I agree. I also think that while it is unfortunate that Link does not connect that well with the Madison BRT, I don’t think it is huge deal. There are connections where it would be. If the 145th station does not connect well with the 145th BRT, then both are screwed. While the 145th BRT line does provide some functionality on its own, its main purpose is to connect with Link. The Link station’s main purpose is to connect to that bus. So if those two don’t cooperate, it effects the vast majority of the riders. Madison BRT is different. The connection with Link plays a much smaller role in its success. There are lots of buses that go downtown, as well as lots of people who live downtown (in areas like Belltown). Likewise, there are lots of people along that corridor headed to downtown. Plus, it is quite likely that folks coming in from Link will simply use an alternative bus. If I’m headed to Seattle U from Northgate, I’m taking Link and the streetcar or a bus down Broadway. If I’m coming in from Rainier Valley, I will take the 48 and transfer, or take a different bus (especially if they add a bus along Boren). It is just the way the geography works out. The light rail line essentially surrounds Madison, so it is less important. It is far more important that there is a good connection for the bus routes coming from the north and west (the C, D, E, 40, 120, etc.). That is bound to be the case. No chance that a First Avenue section connecting two much longer existing streetcar lines might also pay the cost of all the other advances you mention? Will go along with you on a LINK station at Boren and Madison. And no reason Route 70 can’t be changed around for a year or two to see where all the already-existing wire can take it. Common on larger systems for surface line to deliberately connect rail stations. UW to Brooklyn to 65th and Roosevelt to Northgate probably a natural. And best addition to the 44 matter of one key-click: make every third one or so have a “3” on the end. Again. With several years’ residential expansion, could be some more passengers along 23rd who’d rather not wait in the rain at Thomas to get three blocks to Group Health. Fast “Bus Bridge” too. Also, I think general experience of explorers’ clubs whose members refer to India as either “The Raj” or “INN-jah” is that an elephant’s mention depends upon both size of the room and the skill of the taxidermist. Also, tigers’ heads on wall-plaques ally with gravity to do less damage to all the floors on the way to the parking garage. In any large long-range project, if you refer to an elephant as a nuisance, it’ll be a worse one to avoid over your much shorter life . As their only means to remind us that they had regional transit “down” all the way from Thailand to South Africa by way of America while we were contracting the form of rabies that also made our fur fall out same time we started falling out of trees. C’mon, Dell. Whoever invents a keyboard that’ll answer to either a trunk or a foot the size of a wastebasket (just kidding!) will create the world’s most experienced transit consulting concern. Also easily converted to ORCA card inspection. Same for inventor of a rifle with same trigger mechanism. Wall plaque for any AR15 user can be much smaller. And speaking of Extinction, anybody in Congress advocating return of the small arms training that included digging latrines, their plaques won’t fit on the Great Wall of China. That is scheduled for return of the Elephant “EL”-Line if their tribal gods don’t quit putting off the project for another Ice Age. Good for Mayor Durkan for calling for this assessment of the 2015 Move Seattle levy; it was well warranted given the incompetence bordering on malfeasance of the prior administration. I’d love to see a similar strategy employed for the 2014 STBD levy which this blog discussed last week. Frankly I think the average Seattle voter couldn’t correctly distinguish between these two levy measures, both appearing as “Seattle” Proposition 1 questions on their ballots in 2014 and 2015, though they are funded in very different ways and for different specified purposes. (They both do include sunset provsions however.) If my memory serves me correctly, voter turnout for the two measures in the two successive years was something like 56% and 45%, meaning that less than 50% of registered voters even bothered to vote on the Move Seattle levy. FWIW. The proposed changes that the STBD is considering to be making in regard to that levy, as discussed in last week’s blog post on the subject matter, seem to be in direct violation of the specified conditions contained in the board’s resolution (“Resolution 12”) that authorized the levy proposition. It was bordering on malfeasance, it was clearly malfeasance. Both the mayor and former head of the Seattle Department of Transportation knew that the city could not deliver on promises made with MoveSeattle before they took a vote. Neither did anything about it. They could have leveled with the public, and just told them they were going to build what they can build (as the new administration is doing). They could pull the proposal, and go back to the drawing board. They did neither, and purposely mislead the public. I’m glad both are gone, but I wish more people were aware of the unethical actions taken by our former leaders. I agree. I was simply trying to get my point across without my post being edited/deleted by the site moderator. When I made much milder assertions in the past against two of the three SnoCo Sound Transit board members (my subarea) my post was deleted for being a “PA”, which I assume means personal attack. Thinking about Roosevelt RapidRide some more, I have to wonder how much money is really being saved by terminating the line at 65th, rather than going on to Northgate as originally planned. This is a bus line, not rail, so the money saved is basically the cost of the trolley wire, plus a few bus shelters. But this savings comes at the price of having to continue running the 67, so, over the lang run, the capital cost saved just gets eaten up by more service hours. Is there something I’m missing here? It is everything. It is the cost of extra buses, extra drivers, extra planning, extra readers. I don’t think Roosevelt has a lot of construction work or purchasing of property (unlike Madison) but it still adds up. Plus extending it can make it more inconsistent. Unless you spend the extra money to make that additional corridor fast (and thus consistent) you run the risk of messing up the whole thing with bus bunching, on a section that is clearly less important. Between Roosevelt and Northgate is the weakest section, and the actual connection (between Roosevelt and Northgate) is handled by Link. As mentioned up above, there is no reason to assume that we will continue to run the 67 as it exists now. That is like saying that the 12 overlaps Madison BRT, while ignoring the fact that the 12 will obviously be re-routed once Madison BRT comes along. There will be a bus on Roosevelt north of 65th, but it probably won’t have the frequency or the off board payment that Roosevelt RapidRide will (nor should it). So is Roosevelt RR looking more and more like the old 66 that was killed in all the link euphoria? No, it’s looking like the 70. The 70 goes to 50th (although I haven’t kept track of its northern changes), so it’s only a small step to extend it to 65th. The 66 connected Northgate, Roosevelt, Eastlake, and downtown, and didn’t go east closer to the center of the U-District. These routes won’t do that.